When we purchased it 4 years ago, we painted half of it white. 4 years later and there are numerous scratches on top and varnish flaking off. I sanded a patch to see what type of wood was underneath, but that was extra messy so stripping and re-staining was out. 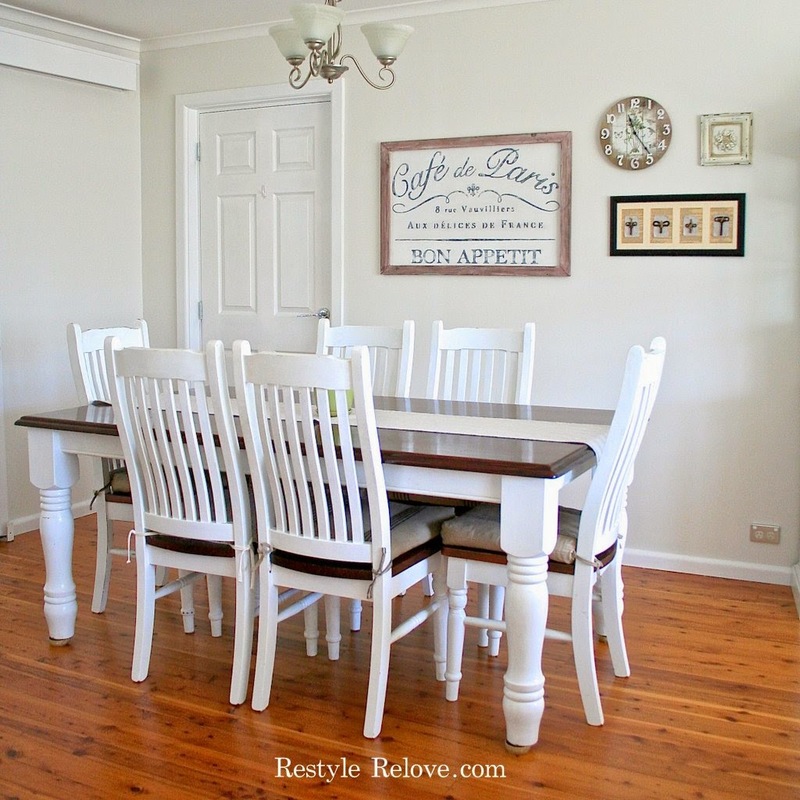 When in doubt, get out the chalk paint! After applying 3 coats of white chalk paint I gave the table a good sand, distressing the edges. Then I got out the tape measure and penciled on my plank lines. I used a wooden ruler and the sharp edge of a metal paint scrapper to cut into the wood and mark out the lines. This left a small groove in the table to add to the authenticity. Then I used 60 grit sandpaper down each slit to make them look a bit wider and more roughed up. Finally I sanded flat down each line to get a bit more distressing on each "plank". Then I distressed the edges a bit more, and lastly gave the whole table another sand with 220 grit sandpaper. To seal and protect I decided to go with a few coats of flat clear varnish. I love this. It really brightens up the room. Great job. Very pretty. I have 2 pieces of furniture to paint, I must try out the chalk paint. I'd love to get the results you did with your table. Fabulous!!! Wow, what a great idea! It looks great too! Wow, your faux technique is truly amazing! Love love love the final result! You are a genius! Your table looks soon great!